The Hilti TE 50-AVR SDS-max rotary hammer for drilling into concrete, masonry and stone, to chiseling and percussion coring The TE 50-AVR suits multiple application needs optimizing user and tool performance on the job. The TE 50-AVR features Active Vibration Reduction (AVR), allowing you to work more comfortably without worrying about fatigue. The TE 50-AVR also features our new detachable cord. No longer will broken and worn cords be a concern. This cord snaps out when too much tension is applied and pops back in to reconnect. The Hilti Dust Removal System (DRS) includes the VC 150-10 X vacuum cleaner featuring AirBoost technology to deliver an impressive 150 CFM of air flow. Automatic filter cleaning system with 10 Gal. capacity excellent choice where mobility, durability, dependability and power are absolute necessities. Tbook.com crawls the web to find the best prices and availability on Hammer Drills and related Tools and Hardware products like Hilti TE 50 AVR SDS Max Hammer Drill/Chipping Hammer with Dust Removal System. For this page, related items include products we find that match the following keywords: "Hammer Drill" at our vendor partner Home Depot. 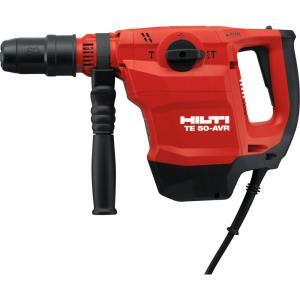 Hilti TE 50 AVR SDS Max Hammer Drill/Chipping Hammer with Dust Removal System is one of 148 Hammer Drills and related products listed in the Tools and Hardware section of Tbook.com If you have any questions on this product, please give us a call at 734-971-1210 during the hours of 9am - 5pm EST for assistance. Thank you for shopping at Tbook.com, the Internet Department Store!